Dr. Bryan F. Beagan was honored to be selected as a “Top Orthodontist” in the Rhode Island Monthly poll of general dentists in the state of Rhode Island from 2012 to 2018. As a part of the University Orthodontics team, Dr. Beagan strives to achieve the highest standard in orthodontic treatment. Through his dedication to excellence and his patients’ commitment to their orthodontic care, creating a healthy and happy smile is possible. Dr. Beagan is most passionate about his interaction and communication with patients of all ages. 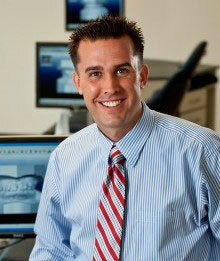 He appreciates the profound effect that orthodontics can have on the lives of his patients. Dr. Beagan regularly attends continuing education courses and seminars far in excess of the number of hours required by the state to practice orthodontics. It is his goal to provide the most effective care to his patients while maintaining an atmosphere of compassion and respect. In addition, Dr. Beagan has served on the craniofacial team at RI Hospital and has been an orthodontic instructor at Brown University. He is also an Invisalign® Gold Plus Provider. Dr. Beagan is a native of Lincoln and currently resides in Scituate with his wife Tammy, son Jae, and daughter Nylah. His free time is spent with his family and friends, running, and enjoying the outdoors. A committed member of his community, Dr. Beagan is active in Donated Dental Services and provides interactive oral hygiene presentations for schools throughout Rhode Island. Melissa Koprusak Everyone on the staff is super friendly and nice. They make the experience so easy. Thank you for being so great! Lisa DeSante Dr Beagan, his assistants and office staff are always friendly, welcoming and helpful. I love the way Dr. Beagan speaks not only to me but also speaks to my child to ensure they understand what's going on. Everyone there is a true professional who cares about their patients!